Captain America! Guardians of the Galaxy! Doctor Strange! Loads more! It can be tough to keep up with all of the LEGO games, but there's good news for those that enjoyed LEGO Marvel Super Heroes - no, not LEGO Marvel's Avengers, the other one. 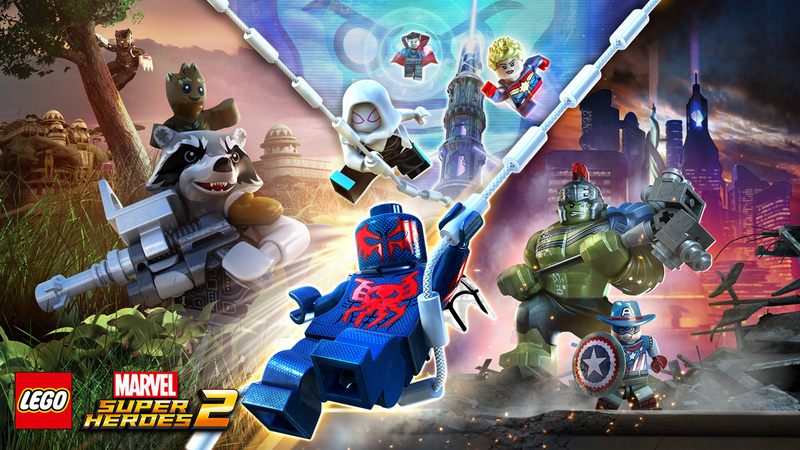 LEGO Marvel Super Heroes 2 has been confirmed, and it's heading for Nintendo Switch in the Holiday season at the end of the year. Rather than tying into a specific movie, these games bring together a whole lot of characters from the Marvel universe into a new tale. You can see a summary and a very brief teaser below. Also of note, this one will feature a "four-player competitive Super Hero battling mode". On top of that PS4, Xbox One and PC have a fixed date of 14th November, while Switch is currently just due for the 'Holiday' period; we don't need to assume that's a negative just yet - it's possible Nintendo wants to announce a Switch date itself. Time will tell. Are you looking forward to this next big LEGO release? This sounds completely ridiculous and insane. Wonder if the lack of a fixed release date is because they will be looking to avoid launching at the same time as a certain mustachioed plumber. The first one was really good, so I look forward to this one. Good to see they're bringing in more obscure (well, I mean not in the mainstream) characters! Although I worry that the X-Men/Fantastic Four are going to get properly sidelined for this, just to screw over Fox. 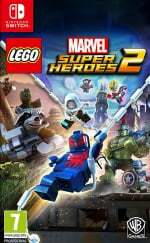 As a huge marvel fan, superheroes fan and lego fan I will definitily buy this day one, I'm not sure wether I will buy this on the switch due to portability or on ps4 due to a platinum trophy. Why do always those Western franchises ? I prefer Non Western Licenced franchises. Long as they bring back a big open world hub I'll be happy. @Aurumonado Looks more like time-travel than multiple universes, based on the article. Doesn't mean that both aren't involved, though. So it begins, the tide wave of Lego games that have flooded every other console since it began. On another note, surprised they've not ported Lego Dimensions over to the Swich yet. I mean they are still releasing new packs for the game right? Really? What's the problem? Last time I checked, not only are most of the licences LEGO has mostly Western franchises, but LEGO itself came from Denmark, a European country, and the game is published by WB Games. Plus, it's kind of expected that another LEGO game would be from Marvel since that was one of the more prominent LEGO sets. I mean, what were you expecting to be the theme for the next LEGO game? Yeah, I'm kinda worried about that, especially with the legacy of both franchises as both the most prominent Marvel series in the 90s and Marvel's First Family. Still, I would probably wait for more info about this game. This could be a huge seller this holiday as it seems like the only toy focused game left at the moment with Skylanders, Disney Infinity and now even Lego Dimensions being rumoured to be defunct w/ it's last wave, 9, this summer. That 4 player battle mode sounds a lot like what they added into Disney Infinity near the end. Lego Dimension also added 4-player battles in year 2. Definite win for the Switch as long as it can get out before Black Friday. Kind of weird a game that many months off isn't dated. Once again, we'll see what E3 brings, now only 4 weeks away. I wonder if Wii U will get it? I know Switch is now and Wii U is dead, but the Wii U install base will still be about double the Switch when this releases. I'd bet PS3 and X360 get it so there's a chance. Wii is probably a bit too old by now. The first one was amazing and by far my favorite Lego game. Count me in. I mean I don't like franchises like Star Wars / Marvel Heroes / Lord of the Rings / Harry Potter / Chima / etc. I ONLY like LEGO City because there is NO such a franchises that I mentioned above. Also, I like Police themed LEGO. Blue color & Futuristic Hexagon shape is the main color & shape for LEGO City and I like Blue color as well. Instant adore. I expect some good themes that emphasis on Sports like Boxing or Muay Thai / Futuristic style ala Spectrobes Disney with NO famous Western franchises at all ( Must created from ZERO) / Japanese touch like Animal Crossing / Musical games with no Guitar Hero influence at all but BEMANI rules (DDR / Beatmania IIDX / Jubeat / Para Para Paradise) or MaiMai SEGA rules. Oops.. sorry for too much Japanese influence. 2099? Oh yes! I hate modern Marvel, but I can't deny 2099. I wonder if classic Captain Marv-ell might pop up. That is the definitive Captain Marvel. Yay. At last a half decent relatively big game announced for Switch. I just hope this doesn't get completely MCU-ified like Lego Avengers did. The X-Men and FF deserve appearances. What I loved about the original game was, despite the character rights issues with Fox, it still managed to include X-Men and it made the in-game open world feel more complete. @gaga64 Sadly, no, The X-Men, Fantastic Four and Deadpool would have to have their own game from FOX Digital Entertainment. That would be a good excuse to include a 20th Century FOX Logo made of LEGO Bricks, and they'd have to animate it getting built by LEGO Minifigure Construction Workers, just like with the Tt Games logo. Yes Yes yes! Spider-man 2099!!!!!!!! "iconic characters, from Cowboy Captain America"
Since when was Cowboy Captain America iconic. I didn't even know that was a thing. Love the Lego games, even though they're pouring them out to death! Really enjoying Lego Worlds on the PS4 at the moment and hoping it moves it's way over to Switch (when I actually decide to purchase a Switch)...hmm...still trying to fully beat Lego Worlds, Lego Harry Potter Collection and still wanting to purchase Lego City Undercover and Lego Star Wars and even Lego Dimensions...something tells me I'll be waiting on this one. Hopefully we get a new and updated Lego Pirates Of The Caribbean (to go along with the new movie) and a large collection of Lego Lord Of The Rings with the Hobbit and what I would really like...bring the 2 Lego Indiana Jones together for an update. Wonder what other Lego titles would be nice to have...Lego Spongebob, Lego Simpsons, Lego Gremlins, Lego Back To The Future Trilogy...kind of can't wait to see what else will come along from Tell Tale games!!!! I barely got through the first 3 levels of the first one, and then realized it's the same Lego game they've been selling us for a decade, just with 10,000 collectibles. Gets old fast. That's major 3rd party support gone for the 3DS. I'll probably get on PC, but good news regardless. @SLIGEACH_EIRE • LEGO games are not half decent relatively big games. Your daily arguments are the ones that are half decent (and maybe not even that). The Lego games are always fun. Too bad all my son plays now is NBA-2K! glad to see it, on the switch. there are a very select able Lego games that i like. not sure if im interested in getting this. Sounds like the perfect time to introduce LEGO Shuma-Gorath if you ask me. Awww, the characters look like crappy toy versions of the real characters. Bionic Venomspit Spider-Man, Heavy Armour Batarang Batman or whatever...and all you really wanted was the characters as you know them. Kids will love it! @Mr_Zurkon Not only was the first one really good, but Lego Marvel Avengers expanded and improved the open world from the first IMO so I'm really excited to see where this goes next. I just noticed something, the first game's characters seemed to be more based of their comic book versions. these ones look much cooler. I enjoyed the first, though a game breaking bug did ruin it for me. I might pick this one up at some point, but I'm not sure for which system yet. I would give anything for a non lego marvel game but beggars can't be choosers. @Ryu_Niiyama I want Capcom to make a Marvel Vs DC. It would be genius. I've been waiting for a new Lego game! Can't wait! Although I will miss having the Gamepad as a second screen for multiplayer. It's back to splitscreen for us all. This basically confirms Marvel (and by association Star Wars and Indy) won't be coming to Lego Dimensions. Oh the fun we could have had. Excellent, the first ones really good, one of the best Lego games around. @onelegchair I liked Avengers as well and the improved/fixed flying controls were very much welcome. @Scapetti Yeah me 2. It was more an observation that Nintendo can support the 3ds/2ds all they want but if major 3rd party support dies out, the handheld line will also die out. Sooner than later. @Angelic_Lapras_King Dimensions is heavily rumoured to be finishing with the end of year 2. Nothing official, but a few signs it could be true. Can't wait for this. I thought the Marvel Super Heroes game was much better than the Avengers follow-up. @Malcrash that points to sequel though. Goodies, Teen Titans Go! And Powerpuff Girls are out this week. I got to admit, I'm actual really hyped for this, I loved the first Marvel Super Heroes LEGO game and this seems like it could be even better! I played the 1st on Wii U, awesome game! Looking forward to this. Oh yes! The first one was one of the best Lego games since the Star Wars games. Spider-Gwen makes it a must purchase for me. I liked the first one loads for telling it's own story. I think that's how it succeeded. Although they literally made it at the time as the license they had for all the Marvel superheroes was expiring. Seems to be the case that they got the Marvel Cinematic Universe characters and not the Fox owned movie properties. Oh well. Should still be good with more original content. @Angelic_Lapras_King I'm not sure if the portal was a problem too in terms of a Switch version. I remember discussing that with @rjejr It would be very difficult to play as a portable, but they could implement a software solution or just make it a dock-only game. Looks as if it's not making enough money, the amount that consumers will spend not keeping pace with the ambition of the game. Inventory must also be hard to manage. If they make a Switch version, they'd surely want to be able to sell all the packs released so far and not just the more recent ones that stores are more willing to give space to. Still a shame as parts of it are great, but Super Heroes 2 will provide some balm. @Angelic_Lapras_King as per @Sakura the guys/women making the Lego D game are moving onto other projects and the last Lego D waves that were supposed to be out already have been spread out over most of 2017 w/ the last, Wave 9, due Q3, so probably this summer. By the time they would have thought about porting it to the Switch the writing was probably already on the wall. It's one thing to port a game, just software, but they would have had to make more of the the original $99 game packs with the hardware portal. That's probably more than they wanted to do. This new software only game makes sense though. Who knows, maybe they didn't announce a Switch release date yet b/c they want to pull a Bayonetta and bundle 1 of the earlier games, either Marvel Super Heroes or Marvel Avengers, with this. Maybe even as a cheaper digital download only. Hopefully they release at the same time though. @rjejr So what is left? Skylanders? I don't count amiibo because they don't have their own game. Ugh, I'm still mad at Disney since they didn't get to the 90s movies aside from Aladdin... at least I got Mulan. I was hoping for a Simba and a Tarzan though. Maybe Quasimodo or Goliath...aww I'm making myself sad. Latest I read on Skylanders was Activision was skipping this year, 2017, but not officially ending it. My guess is they want to take a breather and see if they can come up w/ any new ideas. W/ all of the Sony fanbois salivating over the Crash Bandicoot trilogy remaster I wouldn't be surprised to see them have "Crashlanders" next year. Or something similar. But who knows, maybe toys-to-life really is dead? I feel like as long as there are kids there will be toys to sell, Lego toys have lasted about 100 years, but they need to get everything right as far as stock and pricing. If there isn't a toys-to-life game this year Lego Marvel 2 (I'm never typing the full name again) could be a huge seller as the only "kids" game on the market. SW:Battlefront 2, now w/ all the movies and single player, could be huge as well. If Ntinedo was ever planing on making an amiibo game, this holiday on Switch would be the right time. Actually cross play on both 3DS and Swtich since the New 2DS XL has an NFC reader built in would be perfect. Still no word on Gamefreak for this holiday's Pokemon game, maybe it's an amiibo based game? I'm also still waiting for Pokepark 3, P2 was pretty good. But as far as we know, no toys-to-life games this holiday. Super Mario Odyssey and Xenoblade Chronicles 2 is enough for me anyway, and this for the kids. Yesssss! This is a day one purchase loving lego city at the moment!!!! Bought the first one for the WiiU, only seems apropriate that i buy the second one for the Switch.